Great to have friends round at Kindberg Towers and celebrate Solstice and Christmas etc. The figure on the left is a replica of one of the wonderful Lewis chessmen – a Queen discovered in Uig on the west coast of the Isle of Lewis in the Outer Hebrides in 1831. Last year I ran workshops at schools round Lewis, and this piece was a present from Joe M at arts centre an Lanntair , a memento of my visit. The Queen caused a security incident at Glasgow airport on my way home, which meant I had to unpack everything from my suitcase, as she was at the bottom and set off an alarm for some reason. The central figure at the back is from Barcelona, and the robot is one from my collection (of about 90 I think). 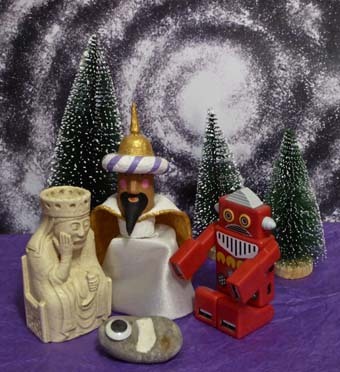 This entry was posted in Events and tagged an Lanntair, Christmas, Isle of Lewis, Lewis chessmen, Outer Hebrides, robots, Solstice. Bookmark the permalink.